I was going to talk about a film I watched last night. 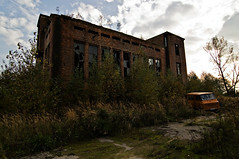 The 2011 film URBEX aka Urban Explorer was directed by Andy Fetsher and distributed by German distributor Universum. It is about a group of five young people who go through previously sealed tunnels underneath Berlin. I quite enjoyed it and will be reviewing it later. As I was trawling the net (or Googling the net if you prefer) to find more information on the film, my eye caught a reference to urban exploration. I went back and clicked on the link to a Wikipedia page. 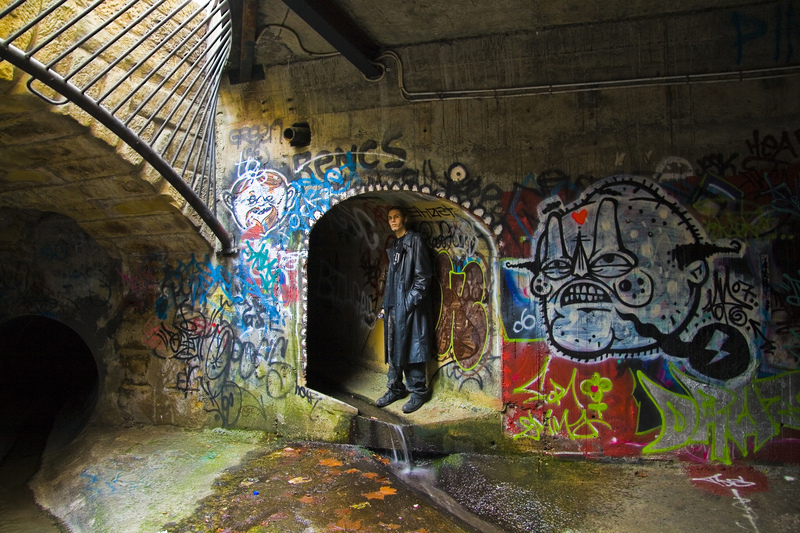 Essentially urban exploration (UE) is something that has been steadily gaining in popularity since 2006. The dangers, according to Wikipedia, are many: Arrest – for criminal trespass or common trespassing. Jail or imprisonment – this one sort of dovetails with arrest. Physical – this can be broken down to personal injury and health issues (mostly due to exposure to Asbestos). I can see the appeal. The article in Wikipedia intimates that this is a new hobby of younger people. I am guessing that includes a demographic of perhaps 13 to 30. Although looking at it, I would probably enjoy participating in the practise as well. I remember getting excited when I learned about the ‘buried city’ underneath Seattle in the mid seventies. This curiosity was given a booster shot of publicity when it featured in an episode of Kolchak: The Night Stalker. Amazingly this curiosity has been around since the 1950’s and it’s first official tour took place in 1965. Seattle underground city. Courtesy of Wikipedia. I felt the same burst of excitement when years later I learned of the buried city under Edinburgh, Scotland. I would have given my right arm to see either of these two fascinating places in person. If you wander through the web, you’ll find that a lot of places have ‘buried cities’ or ‘underground vaults’ all available for public legal touring. My daughter adores old buildings and abandoned industrial estates. They are, to her, the modern equivalent of the ‘ghost town’ and they hold the same fascination as the Mesa Verde held for me as a youngster. But if I am really honest, I feel the same about buildings or areas that are abandoned and forgotten in the not so distant past. I can see the allure of exploring these forbidden places. Places that have been deserted and emptied of human occupants with only the vestiges of prior inhabitants remaining. I worked, for a very short time, for a used office furniture retailer. They would go and survey what office articles such as desks, chairs, filing cabinets, et al, an out of business retailer had left behind. A bid would be put in for clearing out the remaining equipment. If the bid was accepted, we would go in and collect the things for cleaning, inexpensive repair and re-sell the items at a ‘discount’ price. It was while I was working for this small business that I got to experience what could be called a type of urban exploration. The business had been a long running traditional employer of thousands of people in the local area. The company had gone into receivership in the mid 1990’s. I was tasked with another employee from the furniture store to collect any office furniture that was deemed ‘worth messing with’ and bring to the store’s repair warehouse. The abandoned building was the size of two American football fields laying end to end. It was winter time and the inside of this huge mausoleum was ten degrees colder than the outside. Machinery, desks, chairs, filing cabinets and other assorted office paraphernalia was scattered throughout the building. The main area was surrounded by little offices that perhaps the worker’s supervisors had run their sections from. The entire area, including the offices, had a feeling of panicky departure. It looked like a land bound Mary Celeste. Books were left open on desks as if they’d been abandoned mid-sentence. Pens, pencils, staplers and staple pullers littered the desks and the floor. A lot of the pen holders still had expensive pens in them. The desks were full of papers; expense sheets, manifestos, instructions and private correspondence. A few briefcases were scattered here and there. If not for the thick layer of dust that permeated the building and the lack of order and people, it looked as though everyone had just left hurriedly for a fire drill or a quick union meeting. It was eerie, disquieting and fascinating. One room was full of children’s books. Not your run of the mill present day books either. Quite a few looked as though they might be collectors editions of children’s classics. Black Beauty, Treasure Island, and other children’s books littered the floor and filled boxes that were in untidy heaps. When my colleague and I had our lunch break we went into the areas that were ‘off limits’ and explored. These areas were even more fascinating. Where the main area we’d been working in looked hastily deserted. The off limits area looked like there should still be people there working and planning their rosters and task lists. This area was almost clean. The ever present thick dust that had coated everything in the other room was not present in these offices. The look of disarray was not present either. Everything was neat and precise and clean. We both felt a little like cat-burglars so we did not stay long. I don’t know about my co-worker, but I felt like the inhabitants of the offices were going to come in at any minute and throw us out. When we finished our collection of the old office things deemed saleable, we left. I felt like a modern day archaeologist. As silly as it might sound, I felt I knew how the folks had felt that explored the Egyptian tombs and the Aztec ruins. Oh sure, my little exploration of a business gone broke couldn’t compare in importance or significance, but, the snapshots of daily activity in an recently deserted building was fascinating. I can well imagine why people have been increasingly interested in this modern form of exploration. The mix of forbidden exploration of hitherto unknown or sealed locations and the chances of injury combined with the visceral and tactile experiences must be a heady combination that is difficult to refuse. A lot people are curious about life before we came along. Even more so if the life we see is of an infamous or disturbing nature. It will be interesting to see where this variation of time travel will go. Because that is what urban exploration seems to be. A quick look at yesterday or yesteryear, that is dirty, forbidden, dangerous and excitingly real. Loved the post–and I completely understand the fascination with Mesa Verde. Such an incredible place. Thanks for sharing! And thank you for the kind words and for taking the time to comment! Cheers mate! This was a cool post. Thanks for writing it. I went on the Underground Tour in Seattle and was amazed by the city’s story. I highly recommend that tour to anyone that travels there. I come from a part of North Carolina that is bristling with abandoned industrial structures dating all the way to the Civil War. It was awesome to see a different perspective on these sites, as we here in the Wilmington area have always vowed to leave “easter eggs” for future explorers. Sometimes, we will affix a small vial filled with a scroll that has the names and dates of the explorers. Surprisingly, we’ve also found some of these vials in our travels and suspect it is a common practice. It’s always cool to see who else is out there, prowling about the abandoned rocks, bricks, and steel tunnels. That sounds not only fun but interesting. I would have never thought of leaving easter eggs/time capsules with the names of the explorers inside. Kind of like the pioneers who carved their names on Chimney rock on their way west. Cool idea! Thanks for liking and sharing my little post! Cheers mate!! Very interesting article, Mike. I enjoyed it a great deal. Reminds me of something I read in National Geographic a couple of years ago about kids exploring and using the spaces beneath Paris. The buried streets in Edinburgh are meant to be really interesting. Mary King’s Close is one of them. I was interested to read of your experience going in to a company that had gone into receivership. Weird that they had left so much stuff like papers and books just lying around. When I was a kid in NYC we called these “short-cuts”! LOL That’s funny so did we! Thanks for re-blogging and commenting! All support is gratefully accepted and appreciated! Cheers! lolo, mon plaisure of course! Looks like fun too! I look forward to your future posts as well! Cheers! Thanks! I hope I can live up to the hype (small though it might be) LOL>Cheers! Very interesting! I had no idea that this was happening. I know that when people go to a tourist area, sure they want to leave the tourist spots and see what the locals see. But I never knew there was a trend of people going to the off limits area! That sounds fascinating, looking into old deserted buildings. I’d be terrified – I’m a very jumpy person, and the slightest sound would scare me. Even so, sounds like an interesting experiment! Thank you so much! It is fascinating. It is like walking into a time machine of sorts. It is sort of terrifying when you consider that most of these places don’t welcome visitors! But that is part of its charm and quite probably the allure for most folks who do it on a regular basis. Thanks for your words of praise and for taking the time to share! Cheers! Nicely said. I enjoy ‘re-discovering’ those kinds of places. It would be interesting and pleasant to get to find something like the business you mentioned with all of the articles laying about as they were. I once spent some time near Pie Town, NM where I discovered some old dugouts and homesteads still standing (though in disrepair) and I even found an old one-room school house; probably from around the 1910s-20s. Looking through such places is like a dim spyglass into the past and even the simplest of things catch your interest. I’m going to guess and say that NM is New Mexico! I lived there for a short while courtesy of the USAF. I should imagine that it’s full of abandoned areas ripe for viewing. I know Louis L’Amour (the western writer) wrote that a lot of ranches had ghost towns on them, but, nobody knew about them. Such a shame considering that folks would be so interested in them. Thanks for the Bonus points! Cheers! There is a fantastic abandoned cinema in Kingston-Upon-Thames that I visited a few times and it held that same eerie feeling. It opened in 1900 as a theatre, and still has old projectors and film equipment in the small projector room over looking a vast auditorium with steps leading down where the seats would have been. When you’re stood in there its like you can feel the history in the walls. What a fantastic read! Love the subject and can see why you made it to Freshly Pressed. Back in my teenage years, I lived a few months in Seattle. Remember distinctly a shopping area in an underground part of the the city. It was pretty cool and sort of strange in a way, like a whole hidden city within the city. Reading the part about that abandoned place you were in I kept thinking ” I bet he wishes he’d had a camera that day “. Though, you described it perfectly and I agree it’d be a great set for a movie. Nice post, thanks for bringing it to us. I’ve done some urban exploration in New York and Mass. and while there are many places hidden and buried to explore, the surprise is finding the things in NYC that are hidden in plain site. There is a thrill to UE that cpmbines the excitment of exploration with the danger of the forbidden and (depending on the site) the danger of the unknown. A couple of the places I’ve explored have been in danger of collapse or had other physical hazards. Interesting post! I remember reading about urban exploration in a newspaper a while back and your post brought it back for me. Congrats on being Freshly Pressed! Thanks! I’m still a bit shell shocked by the whole thing. I only wrote the post because while I was doing research on a film for reviewing, it came up in my Google search. It caught my eye and made remember my ‘own’ urban exploring. Cheers! Enjoy the ride. It happened to me on June 20, so I believe I understand some of how you’re feeling right now. But things do calm down later and you adjust to the new normal. The wildest part was going to my inbox. It informed me that I had 641 unread e-mails. Whoa. LOL That’s brilliant, I had no-where near that amount, what I did have was a astronomical view count and a ton of emails. I took one look and thought, ‘well, it’s up.” Cheers! Interesting article. I work as an English teacher in Barcelona and over the years have done many in-company classes. This requires that I travel to the industrial parks which acn be found on the outskirts of most cities. As the Euro crisis worsened these places began to empty out in the frenzied manner described in this post. While I’ve never actually had the “cojones” to enter any of these buildings, I’ve looked in windows where I could see fully furnished reception and office areas, coffee cups on the desks and all. I also had the opportunity to observe the evolution and decay of these places as nature and/or squatters inevitable took over. It’s amazing how quickly a neglected building becomes a creepy example of (sub? )urban decay. There are also a huge number of abandoned construction sites that look like they were left in the middle of a workday with machines running. These also decay incredibly fast. Someone should run a Spanish expedition. Sounds like a good movie. Thanks for bringing it to our attention. You might like this site on abandoned building/site exploration: http://www.opacity.us/ Cheers. Yup, I haven’t checked out Opacity in a while but formerly visited frequently. I recall there was a hotel with mushrooms coming up through the ballroom floor or something. Then there were the photos of autopsy trays in a mental hospital… There’s something enchanting about abandoned property, alluring yet creepy. Back in college I recall going through the tunnels under the campus. We called it… ready? “Tunneling.” How clever. Verbotten of course, but very fun. That’s funny! I think that it’s still referred to as tunnelling, see? You guys were trail blazers! thanks for sharing! This was a joy to read. Kudos to you! Interesting concept;this urban exploration of buried cities. It’s sort of new to me.I can only imagine what it would be like. I bet some of these places hold a lot of secrets that could stir up controversies if found. wow. I really like it… Great post. Not just boys. When we lived in the country, I loved to “explore” the woods and fields around our house. In the suburbs, it was unused barns, workshops, a burned-out house, and so forth. Later, when I was old enough to drive, I loved to explore abandoned buildings. In Texas, at least in my world, abandoned buildings are usually along the railroad tracks and were factories or depots for loading crops onto trains. I also had some good, scary times exploring the almost-abandoned waterfront of a western city that shall remain unnamed. One of the best “explorations” happened at a lake. The Corps of Engineers built the lake, but they underestimated how fast it would fill with water. As a result, the bottom contained full-grown trees, at least one bridge, and other things. I found a campfire–under about 15 feet of water, that looked as if it had just been put out. And I found a house–a whole, modest house–under the water. I was free-diving, so I couldn’t take as much time as I wanted, and when my parents found out, they grounded me, but it was completely spooky and cool. Oh, and out west–mines. They’re everywhere. Not just cities. You should check out the utility tunnels under your local university. (This requires stealth and planning, or an inside man.) Great stuff. Thanks for this interesting post and congratulations on getting Fresh Pressed. Great post! I dabbled with that stuff when I was a kid, we never had a name for it, just boys being boys. Scampering over rooftops and through the gaps of chain-linc fences, exploreing and otherwise staveing off boredom. Occasionally bumping in to some of the fauna of are little piece of urban jungle, I remember climbing out of a small window in a (we thought ) abandoned building and as I lowered myself with a distinct lack of grace I noticed my friends running off. Turning I found myself face to face with a scruffy looking gent, as I ran he gave chase and to this day I remember his shadow closeing in on mine (the sun was at my back). Fear, they say, give’s men wings but it seems it will furnish a boy with roller skates and a jet-pack. I think there is a fascination with anything that has been abandoned. Look how popular the American West’s ghost towns are. But there’s something about viewing a building or area that has been deserted seemingly in a hurry. Glasses half-filled with dried out liquid, ashtrays half full, plates with remnants of food, Mary Celeste with a foundation and walls. Great feedback dude, but then, I’ve come to expect nothing less. Cheers mate!! No worries, you should check out a book called ‘ The world without us’ the author visit’s place’s that have been abandoned or otherwise uninhabited such as chernobyl, the dmz between north and south korea, and Famagusta the cypriot ‘ghost city’ that was evacuated back in the 70’s and then sealed off. keep up the good work. Hey thanks for the heads up on the book. I’ll definitely be checking it out, it sounds fascinating! Oh and thank you for your kind words of praise/support. Cheers!! Dude, did I answer you on this comment? I thought I did, but it’s not showing up on my comments section. If I haven’t, let me say that it was a great comment. But then I have come to expect that from you! Cheers mate!